The Spirit of giving. What is it exactly? Whether we give out of expectation, obligation, to avoid guilt, or for the pure joy of it, we give because not to, would feel worse. What is a thoughtful gift anyway? I would say, it usually has the recipients wants and wishes fore most in mind, though haven't we all received a present that seemed to speak more about the person giving the gift? More times than not, the "gift" is something they themselves valued and wanted to share with us. These are the gifts that are sometimes presented with the prefacing statement "I know it's nothing you've ever expressed an interest in, but I love loved it and just know you will too." Ideally, gift giving is a compromise between the values of both giver and recipient. It provides a wonderful opportunity to step outside ourselves, and really see and consider each others' desires and interests. But it is difficult to give a gift we ourselves find little value, and perhaps that is a contributing factor to this more egocentric type of gift giving. One might question whether that type of present even qualifies as a gift. Though the motivation seems pure, they loved the item and want it to bring as much joy to our life as it did to their own, do these kinds of gifts truly have us in mind? When ever I went shopping with the girls to help them find presents for their Dad, they would pick out Etch a Sketches, glitter pens, kitties, all the things they valued and would love to get as presents. I would constantly have to remind them that that they should think of what Daddy might find useful or appreciate. I wonder how often we fall back into that kid like mentality, of giving what we ourselves would like to receive. 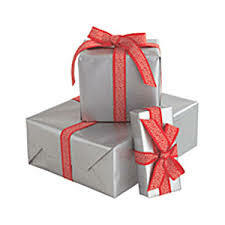 Interesting how in the end, it can be the receiver of one of these types of presents who is the one to give the true gift, by receiving gracefully the unexpected and undesired item. It is after all the thought that counts.